A truly excellent preschool program is not a miniaturized version of elementary school. Early Childhood educators know that a sure way to create school burn-out in young children and to turn them off to learning is to try to teach a standard kindergarten or first grade curriculum to Pre-K students, including piling on homework. A good preschool program does not have little children sitting in desks doing worksheets. Rather preschool needs to be a play and movement centered program that appeals to the natural learning styles of most small children. For students to be prepared to undertake the academic challenge of elementary school, Pre-K needs to emphasize the social-emotional skills of sharing, caring, conflict resolution; self-control, listening, and following directions. This important learning must come first for future academic success. Math manipulative are used to teach correlation, sequencing, patterns and other age appropriate math skills. The Handwriting without Tears” curriculum, instead of forcing children to write at such an early age ,uses clay, painting, markers and crafts to develop the small muscles needed to hold a pencil properly and cut with a scissors accurately, and thus is more age-appropriate. Every study that’s been done on teaching reading to children comes up with the same conclusion: between 92% and 95% of children learn best with a phonics-based program. A tiny percentage of children have exceptional memories and are sight readers. But for most children, learning the sounds the letters make in order to build words is critical to becoming a good reader. This can and should be taught in Pre-K. Using a kinesthetic or movement based program like Jolly Phonics, children learn the sounds with a memory-connecting movement attached, which makes the learning fun and playful. The children don’t even know they are learning! How a child is taught, is the critical component, not just the curriculum content. It’s important to honor the individual developmental pace of each child. Parents and teachers must have realistic and varied expectations based in part on each child’s aptitude, interest and readiness. Just as some children walk at 9 months and others not until they are 18 months, they all learn to walk. Some children are ready to learn pre-reading skills by three years of age while other may not be ready to read until they are five or even six. Know and honor the child and their personal pace. Preschool children need ample opportunity for imaginative play, arts and crafts, music, dance and unstructured free play both indoors and out. This provides the opportunity for self-discovery learning, which is the first step for those who will someday become future engineers, scientists, inventors and innovators. Children require opportunities to figure out how things work, how to fix things that aren’t working, and how to problem solve for themselves rather than have adults direct and manage all their activities. This level of learning is one of the most important aspects of early childhood education and ties into the “primacy of self discovery”. It cannot be emphasized enough how important free play, imaginary play, outdoor nature exploration, facing challenging and new experiences, and field trips are for young learners. Children need to interact with nature to appreciate and become good stewards of the environment. Children at New Hope Academy are growing gardens and playing in unique nature-based playgrounds that include a labyrinth, outdoor musical instruments, and living willow structures. 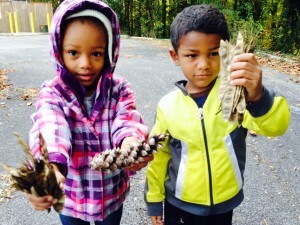 Our 8-acre wooded campus is a living outdoor laboratory for environmental education. Partnering with the University of Maryland’s Landscape and Storm Water Management Departments our students have worked with undergrad and graduate students to design and plan nature playgrounds and gardens. In the process we discovered significant storm water management issues on our land and the adjacent Town of Landover Hills property. We applied for and have been awarded several grants, from Chesapeake Bay Trust and the EPA and are now entering the implementation phase for green solutions to these issues, including bio-swells, rain gardens, permeable pavers, a demonstration green roof and cisterns. In preschool the children begin planting gardens, and harvesting and eating their bounty. Composting, recycling programs, time for ample recess and physical activities, and lessons on nutrition all help the students to appreciate the miracle of life. The students learn how to take responsibility for their personal health as well as the wellbeing of the natural world around them.